This was held for the first time at Moorlands Community Centre with the usual cooked breakfast delivered and set up by Abbevilles; big thanks for going the extra mile. 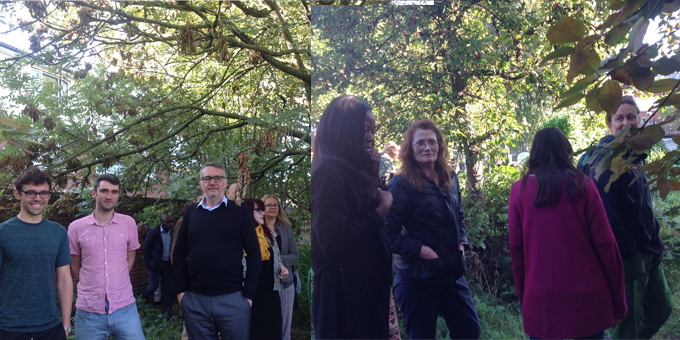 Collaborative members took a tour of Moorlands Nature Garden Allotment, which backs onto the community centre guided by Loughborough Farm coordinator Emily Myers. The farm has been working here in partnership with Metropolitan housing (voluntary and with small funding) for several years after they were invited by local resident Kathleen McCann who wanted to engage local people. It consists of allotments, a community plot, a school plot (Hillmead Primary School), orchard, wildlife garden and – following engagement with the organisation Froglife – a hibernacula and bog garden. The farm’s Grant Smith, London mentor for National Allotment Society, is supporting the allotmenteers to set up a management committee. A few families had recently visited the plot via Incredible Edible LEAP (Lambeth Early Action Partnership) and the organisation’s Programme Coordinator Helen Wiggins outlined its wider remit (see links below). Also present was Elaine Parsons, Better Start Worker, Hill Mead area who runs a Stay and Play group at the centre – who highlighted mental health issues among parents – and Saba Yazdani, Health & Wellbeing Officer from Metropolitan’s Neighbourhood Investment Team. • Felt that they needed to be doing more to engage with younger people as average age of members was at Mosaic was over 30. Therefore secured seed money from commissioners for half a post initially and then attracted more money to fund a full time post – the young adults coordinator – which Nicki now holds. • Worked hard to increase referrals of young adults and also focused on developing partnerships in Lambeth with the Princes Trust and Arts Admin amongst others. • Monthly forum for young adults quickly turned into a weekly committee where the group discusses a range of topics from upcoming events to current projects. o 69 young members who have accessed 130 work or education opportunities. Following this, Mosaic Clubhouse members Josh and Debora gave moving testimonials about their lives and their experience of the young adults programme at Mosaic. Both Debora and Josh were congratulated by the Collaborative for their achievements and thanked for telling their stories, which helped to build up a picture of the work at Mosaic. These stories can be accessed in the recovery story section. See link below. Denis suggested that it would be great to get people from the young adults programme involved in the design of services in the LWN Alliance and the Mosaic team said they would be keen to get involved! On Tuesday 11 September, there was an event for project group members and users of services to review the current state of proposals for redesign of service. There was positive discussion and challenge and there will be another event in 3rd week of October. It is planned to expand participation at this event and include a wider range of stakeholders. Cherry asked about how best to feed into the working groups if not part of them and Neil suggested that people could contact him or other members of the Alliance team by email at present. In future, there will be a website for the LWN Alliance as well as a feature on the Lambeth Together website where you can submit questions and comments; however these have not launched yet. • Need to integrate services, so that people don’t have to access multiple parts of the system to get the support they need. • Challenge of demand at the front door. Lots of people being introduced with range of issues such as housing, benefits, which need input from other agencies. Need to consider how best to utilise and connect with other offers. • Question around people who no longer require secondary support but do need ongoing social support – need to consider what is the best offer for these people. • Reducing the number of people admitted to services who are known to services. How do we make sure that community teams can support people early and well enough to not require admission? Helen Wiggins gave a brief update on the Incredible Edible LEAP programme. This programme has 3 strands to it: physical exercise, cooking and eating together and growing food. Helen pointed the Collaborative to the website where there is a map for community food projects in Lambeth. Incredible Edible has 89 group members and 181 individual members. Also recommended the group to look into the Project Dirt initiative! Click here for more information. Maresa told the group that most people using the service are actively suicidal, which is challenging. Also, people in the younger age groups seem to be particularly volatile. Referrals from A&E and CMHTs are increasing as awareness of the service increases but it is challenging with only 2 staff, especially when people are collected as this leaves only 1 member of staff at the Sanctuary. Moyo suggested that developing awareness of Solidarity is still proving challenging. Over the last month, there have been 54 calls and 4 face to face meetings. Like the users of the Sanctuary, also noted suicidal thoughts in people using services. Karen reported that a meeting had been held in September to revive the Peer Support Network, including carers and they plan to meet monthly. • Recent event around the 10 year anniversary of Sean Rigg’s death. Lots of interesting discussions and video has been uploaded onto their website. • Black Thrive are working closely with the Brixton Reel film festival this year, talking to people about their experience with mental health services. • Black Thrive are also preparing for World Mental Health Day on 10 October 2018 and working with Lambeth Council around training and awareness. Mooorlands resident Sharon Mallet gave a moving introduction as carer and Community Connector (Project Smith) dedicated to mental health and hoping to be more involved. Maresa Ness was also congratulated on receiving a Going the Extra Mile award at this month’s NHS Lambeth Clinical Commissioning Group 2018 Lammy Awards!